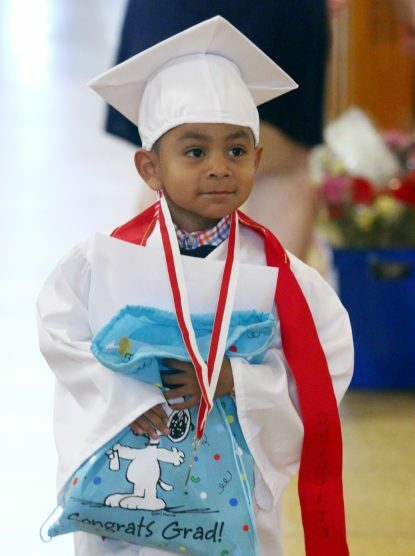 More than 50 students took their first steps in their academic careers with their graduation June 22 from Casa del Carmen Preschool Academy, part of archdiocesan Catholic Social Services (CSS). Last year Casa, which is supported by the annual Catholic Charities Appeal, provided a wide array of resources to approximately 13,000 individuals, according to administrator Camille Crane. 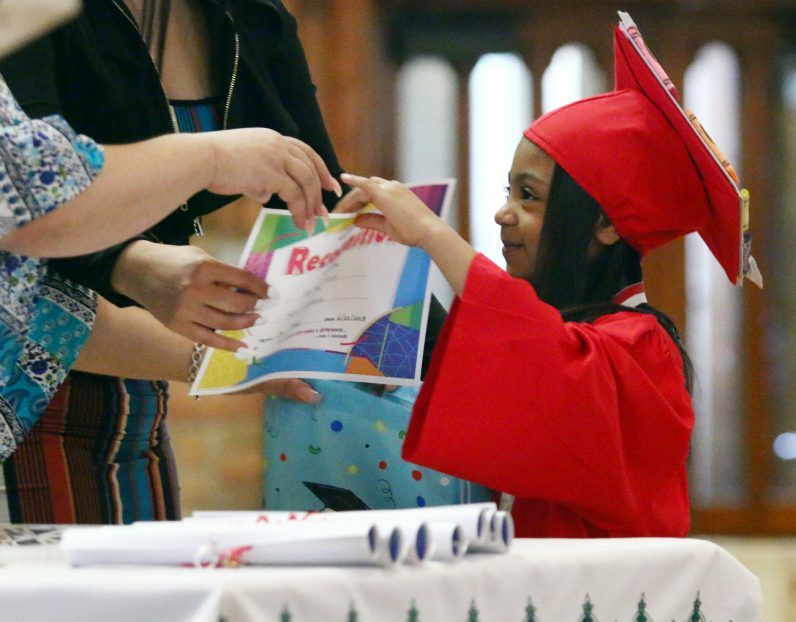 And while the sight of 5-year-olds wearing graduation gowns had parents scrambling to take pictures, the ceremony that took place at Holy Innocents Church was about much more than mites in mortarboards. Gold, a Chestnut Hill College graduate with 25 years of teaching experience, focuses on developing a learning environment that provides structure and safety. The preschool is open year-round from 7 a.m. until 6 p.m. every weekday, offering classes in science, math, reading and listening skills. Art activities, play periods and naps round out the day, which includes breakfast, lunch and a snack provided through archdiocesan Nutritional Development Services as part of the federal school meals program. Like the rest of Casa’s staff, the academy’s teachers are bilingual, and lessons are taught in both English and Spanish. With a waiting list of approximately 30 children, the academy has earned high marks with its funding and regulatory partners. The Pennsylvania Department of Education gave the school its highest rating in recognition of Casa’s responsive early education strategy and overall management. The city-licensed academy receives funding for preschool tuition through the Philadelphia beverage tax, but not during the summer months. Catholic Charities funds help support the academy year-round. View a photo gallery and watch a video of the Casa del Carmen Preschool Academy graduation. In addition to completing professional development requirements, the school’s staff must satisfy background checks and meet state educational guidelines. Both Gold and Crane note that Casa del Carmen’s long history and deep roots in the community make it a trusted resource. Many staff have worked at Casa for a number of years, including teacher Rosabella Gittens. That approach led former Casa del Carmen intern Valerie Ortega to enroll her son, Noah, in the preschool academy. Ortega also noted that her son’s socialization skills blossomed during his time at the academy. In fact, studies have shown that early childhood education significantly improves social and cultural skills, especially among dual-language populations — a key objective for Gold and her team. Over so many years, such wonderful work! Casa del Carmen is doing fine.